Worrapolava: "Geordie Neil is top of the pops!" "Geordie Neil is top of the pops!" Don't they look YOUNG! Well, it was 24 years ago. 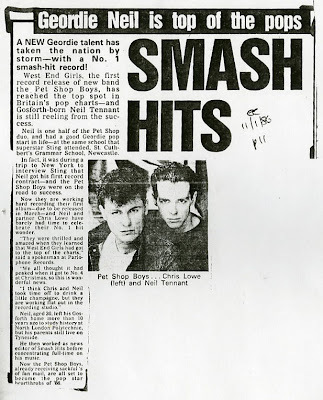 Here's a clipping from the Newcastle Evening Chronicle from January 1986 heralding the Pet Shop Boys first number one, West End Girls. Clicky piccy to make it biggy. The band thought the record had finished its climb up the charts: "We all thought it had peaked when it got to No.4 at Christmas, so this is wonderful news". The Geordie connection meant Neil would always feature in the Chronicle thereafter and because he went to the same school as Sting (and me!) his name would forever be connected with The Police front man. "Lorraine! There's somebody at the door!"